For Fashion Revoultion Week , Elaine & her team demonstrate for us giving insight into how is jewelry made ? Where do metal and stones come from and how is it formed into the pieces you wear every day ? 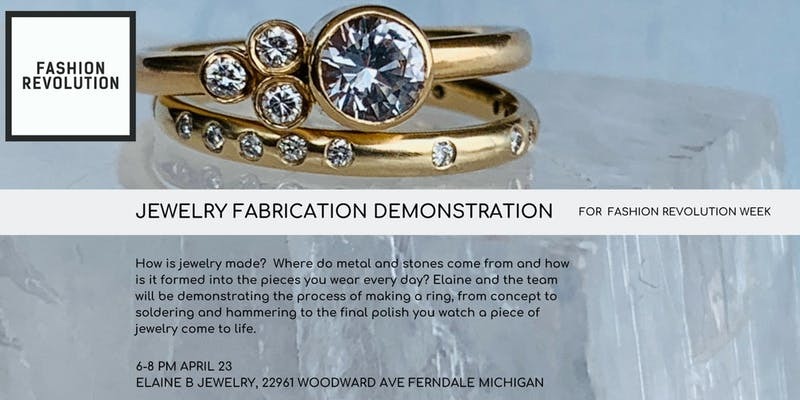 Elaine and the team will be demonstrating the process of making a ring, from concept to soldering and hammering to the final polish you watch a piece of jewelry come to life. Elaine B is a jewelry design studio in Ferndale Michigan. Inspired by the earth and architecture, we create everyday pieces that are minimal yet detail-driven. We appreciate the origin of handmade objects and the stories they tell over several lifetimes. Our product is intentionally crafted for heirloom quality and is guided by an ethic of creating beautiful pieces while supporting the talented artists who’ve made them.